Photo courtesy: Brailsford & Dunlavey Hellmuth, Obata, & Kassabaum, Inc.
Pomona, CA – California Department of Finance has transferred the Lanterman Developmental Center property, an approximately 300 acre property near the Cal Poly Pomona campus, to California State University in an effort to benefit Cal Poly Pomona’s education mission as well as the surrounding communities. 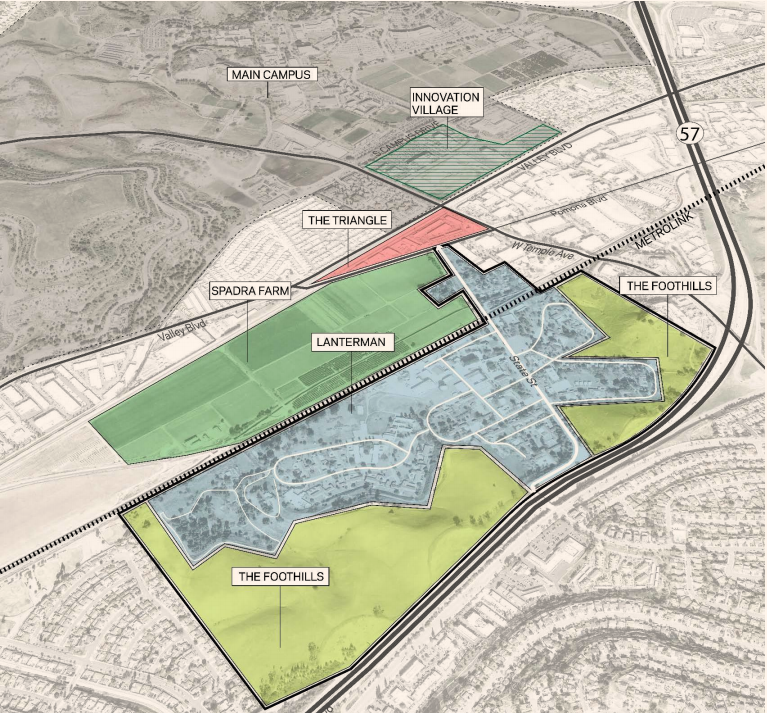 With a team of experts assembled by Cal Poly Pomona, and an external team of experts with a diverse set of skills and expertise including civil engineering, design, and land use planning, Cal Poly Pomona has conducted extensive feasibility studies and has concluded that the Lanterman Developmental Center property is suitable for development. The Lanterman Developmental Center property is bordered by California State Route 57 in the east, Temple Ave. in the north and Valley Blvd. in the west. The property was declared a surplus real estate property by the State of California in 2013. Jurisdiction over the property was transferred to Cal Poly Pomona on July 1, 2015 through a Memorandum of Understanding agreement with the California Department of Finance. Since then, the team assembled by Cal Poly Pomona and an external team of experts have worked together to survey the area and conducted detailed site analysis, building condition assessments, transportation and circulation analysis, historic preservation analysis, and market demand analysis. Detailed analysis shows that the site contains 131 buildings with 93 buildings, built between 1927 to 1969, eligible to become the Pacific State Hospital District – a name derived from Pacific Colony Hospital, the original name of the building complex – as defined by standards set by the Department of Interior. “Preserving the Site’s historic structures and using them as a foundation for a new community and to establish the appropriate scale of new development can enhance the sense of place at Cal Poly Pomona, anchor the Site in its prominent place in California history and bridge the needs of students and the community at large,” according to the due-diligence analysis. Walnut residents with questions or suggestions for what kinds of development they would like to see in the Lanterman Developmental Center are welcome to contact Talitha Tyler at ttyler@cpp.edu. More information about the development can be found at www.cpp.edu/~lanterman/index.shtml.